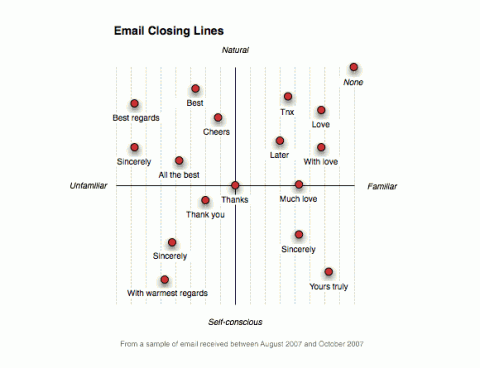 This blog post is a few years old but still timely: Liz Danzico makes us think about our Email Closing Lines. If a closing line can be so meaningful, so important, why are emailers squandering the opportunity, putting no thought in the closing? Time, perhaps, iPhone-finger exhaustion, multi-tasking—they’re all possible excuses. And many times, acceptable ones. We can’t be expected to neatly tie up every email every time. But once in a while, it would be delightful if people applied the same sincerity to the last impressions that we do to first ones. My personal closing line “Waving from Brooklyn” is not on her list. What’s yours? There’s nothing I hate more than the short and sterile “Best”. No one says that in real life, I’ve never heard of it in era of paper-and-pen letter writing, and it says absolutely nothing. I would like to see an updated version of this. I can easily think of 5 closers I see/use that aren’t listed. I don’t use a closer of any sort… just my name. Yes, I’ve been told that it’s rude. I usually use “kind regards” when I email someone senior, being a foreigner it’s even more difficult to assess what is appropriate and what would sound odd. I remember being taught at school that the safest option is to use the level of formality that your responder is using. that sounds sensible to me. When someone signs off with ‘Best’ it sets my teeth on edge. Best what? I generally use “Please take care” unless it is a link to a cat video and then I use “Enjoy!”. Why is “Sincerely” on there 3 times? “Cheers” is my most common closing line (in email and in real life), and at times I’ll use “Many thanks” if I’m trying to be extra appreciative. ….was the sign-off in an email from the great experimental composer Fast Forward. I agree with Prescott and Jason, when someone signs off with ‘Best’ . I get super agitated. Especially when it is an email requesting extra work, something free or above/beyond the usual. I love the French sign-off from Francesca. Can I use that in my own emails? Wonder where “Take Care” fits in? Thank you very much for this chart. As a non-native speaker I’m always wondering about the appropriate closing line. I like your “Waving from…” a lot. Okay … I’m guilty of using “best”. Just seems appropriate for the abbreviated world of e-mail and the recipient is free to choose best “what”. And Preston, who ever says, “Sincerely” or a number of those listed in the chart? Can’t the written be different from the verbal. When I see “cheers” I imagine the other person is drinking on the other end. But lest I be considered “snotty” (which is true only when I’m suffering from a cold) I’ll retire “Best”. I don’t get why people don’t like “best.” I love it. I went through a period of not using it simply because I’d read online how many people hate it. But from me it is sincere, it’s to the point, it doesn’t feel self conscious and I like it. I also like all the best. I wish I could pull off cheers, but I’m not British and truthfully, many an email does not invoke the cheers ending. C’mon. I hate ‘best’! It’s just seems lazy to me. I usually stick with “Kindest regards” for the official and/or unfamiliar, “Cheers” when appropriate, and “Big luv” to my friends. I know it’s dated but I prefer “Much obliged” when dealing with strangers, particularly those of whom I am asking a favor. “Much obliged” is old-timey, but I really like it, Evan! Add me to the list of people who hate “Best”. Best WHAT? I usually stick to “Thank you” or “Thanks” for business correspondence, depending on how familiar I am with the person. ps: also dislike “best,” and “cheers” when the sender is not from the commonwealth. I usually use, kind regards, or, all the best. If I am emailing out of the UK I generally say Greetings from the UK. I’m always formal with my clients, the closing sentence in your written communications is just as important as your phone answering message. The closing message I find most annoying is the “sent from my iphone” seriously, am I supposed to be impressed that someone has an iPhone? Everyone has an iPhone, and everyone who has an iPhone knows it’s a POS, myself included. Can’t beleive Tnx made the grade. Text speak will never surpass the Tigger inspired TTFN – Ta Ta for Now! iDevice says Hi, I say Bye. If someone uses God Bless I mark it as spam. Work and formal > Kind regards. They teach that in school in the Netherlands, so that’s what I thought was appropriate :). Hate the “best”, cheers”, “toodles” (especially cuz that was kind of a trend here when I was 12/13 :D). I hate “Ta”, and “Take Care”. Haaaate. May you get all the green lights on your way home today. May you get the fast lane on your next trip to the grocery store. all best seems sincere- esp. with someone you want to get to know MUCH better.